With so many wave shooters on the VR market, my interest is often piqued when a title comes along that decides to do things a little differently. 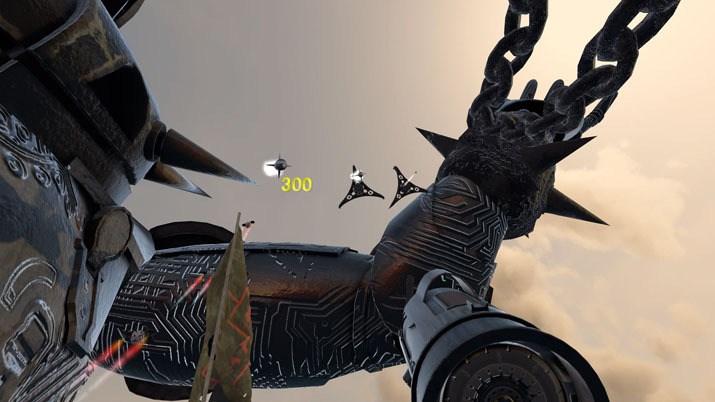 So, when I saw that a core element of Gappo's Legacy VR's gameplay involves punching, grabbing, and tossing robot enemies, I was excited to check it out. I mean, shooting robots is fine and all, but sometimes I just want to let ‘em know who's boss. Unfortunately, this automaton-destroying release from developer and publisher Odysseus demonstrates the all-too-common truth: unique ideas alone are not enough to carry some games. Gappo's Legacy is a strange case where every sliver of potential or production value is undermined by a slew of issues and baffling design choices. A perfect example of these contradictions is in the mode which allows you to dual wield weapons. Dual wielding needs to be unlocked by completing other modes, and when it is available, the gameplay is fundamentally changed, as you aren't given a shield and punching is much less effective. You go from playing defensively to offensively. Sounds good right? The problem is, key elements of the mode are broken from the ability to dual wield. For example, in the second (and last) level, you are meant to push a switch on some suspended scaffolding to start your ascent. As you're unable to grab anything while laser cannons are on your hands, you must wait until the elevator starts rising automatically, all while the words "Push to Start" hover over the highlighted lever. Furthermore, upon completing the mode, it's impossible to input your initials to save a score locally — or even to hit continue as, once again, you need a free hand to do so, meaning you need to exit out using the menu. What this shows is that some features were half-baked in their implementation, being thrown in without any adjustment to cater to their pros and cons. Another example of this is the novel "boxing mode," where all you can do is grab and punch enemies, as guns are disabled. This challenge would be a fun diversion if the enemy types and patterns fit the restrictions. Unfortunately, the robots' variety and routes are the same every time; which consequently causes boxing mode to be mostly a waiting game, as projectile-firing baddies fly beyond your reach. The waiting is punctuated by intermittent appearances of kamikaze robots; the only foe that gets within grabbing distance. This further indicates that modes were thrown in with little concern as to whether the gameplay was in service to them or not. The best elements of Gappo's Legacy are its world building and attempts at immersion. That being said, frustrations abound, even from the opening level. Gameplay is another mixed bag. What's done well here is the satisfying shooting that makes you feel like Megaman when using the mega-buster like arm cannon that can do regular as well as charged shots. The laser gun isn't the only strong point, as everything from the shield to the slow-motion ability is intuitive and functions well. Additionally, rather than simply having an upgrade menu like many wave shooters, you unlock Gappos, which are tiny, floppy disk-like cards that you install in your arm, granting you various powers. These Gappos and their in-universe explanation of upgrades are an example of the best elements of Gappo's Legacy, namely, its world building and attempts at immersion. That being said, frustrations abound, even from the opening level. The first four or five times that I attempted the only mode unlocked at the start of the title, I found it far too chaotic and difficult. The large number of enemies on screen, projectiles, and worst of all, exploding kamikaze robots was sensory overload; managing all of this without dying seemed impossible. However, due to robots appearing and following the same pattern every time, I had the wave memorized after a half dozen tries or so. This is not difficult to do well. I never got any better; I simply had the patterns drilled into my brain, resulting in frustration, rather than satisfaction, upon completing the mode. As jarring as this initial difficulty is, what's more baffling is that almost every other mode unlocked after survival involves chasing high scores while you're invincible. Why the hardest part of Gappo's Legacy comes first, while nearly everything else is a cake walk, is beyond me. Another disappointment comes from the Gappos themselves (which, yes, I praised earlier). What seems like fairly standard power upgrades turn out to be a bit of a bait and switch. Other than the slow-motion ability, which is persistent, Gappos are little more than visual representations of the modes to which they correspond. There's no customization or choice whatsoever… the mode that you pick determines the loadout (what Gappos are utilized). The joy of progressing and unlocking new abilities is undermined by the developers holding the reigns and making the choice of how to play for you. 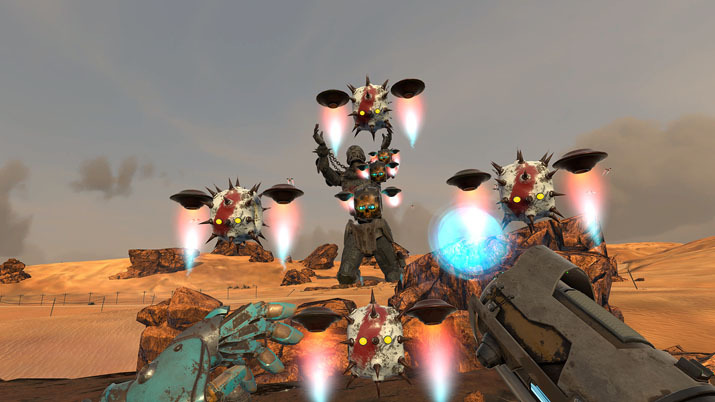 Other aspects of this VR shooter fare better — or in some cases, much worse. As mentioned, the world building is more than you'd expect for a small indie title. Though there isn't much of a story, it's delivered compellingly. Players are told by a woman that robots rule the world and that mankind is enslaved. The MRA (Makina Resistance Army) is the only thing that stands against these machines. That's all the information given, but Odysseus makes the world feel real using visual storytelling. Resistance graffiti is sprayed painted on scaffolding, an enormous statue of a man in chains looms over the landscape, and the remnants of human civilization dart the desert environment. Speaking of the environment: it looks handcrafted and detailed, unlike many budget titles that are seemingly thrown together in five minutes with basic Unity assets. Another aspect of surprising production value is the woman who delivers the narration. If she's not a professional voice actress, she certainly could make it as one. Her line delivery is natural, bearing none of the awkward script reading hallmarks that most low-budget titles feature. With a visual presentation that has apparent care put into it, it's a shame that the music choice didn't get the same treatment. The soundtrack is a mix of generic rock overlaid with jazzy trumpet music you might hear in a French café; it's bizarre. All that being said, Gappo's Legacy's biggest problem is how it performs. The frame rate constantly dips, and in some cases, the game turns into a glorified slideshow. In one mode where you get extremely fast firing Gatling lasers on each hand, the frame rate probably never went above 15-20 fps the entire time. Low framerate is VR's worst enemy. I never get motion sickness or any discomfort from VR, but the low FPS in this title gave me a splitting headache.